With demand for food rising with China’s growing population and economy, domestic companies are looking to boost investments in resource-rich foreign countries such as Brazil and Indonesia to fill the food supply gap at home. The soybean harvest from the 200,000-hectare farm in Bahia produces edible oil for Chongqing and cities in China’s southwest region. “Per capita income and the number of middle class will continue to soar in China. The biggest attraction of investing in abroad is that domestic demand is strong for all sorts of agricultural products. Products like soybean, corn, beef and pork to a certain extent have become more dependent on foreign markets,” says Hu Junlie, president of CGG. China imported 19.8 million tons of soybeans from Brazil in 2011, accounting for 38 percent of China’s total imports (52 million tons) from supplying countries, according to the Ministry of Agriculture. This helped Brazil surpass the US as the biggest soybean exporter to China. Brazil is rich in resources such as fertile land and water. Brazil heavily relies on imports and the Brazillian government is encouraging foreign businesses to invest in the nation’s agricultural sector, says Lu Bu, a researcher specializing in agricultural resources at the Chinese Academy of Agricultural Sciences. CGG’s next move is to grow soybeans on a 130,000-hectare farm in Argentina’s Chaco province with a total investment of $420 million. The first phase will cover 106,000 hectares of farmland. 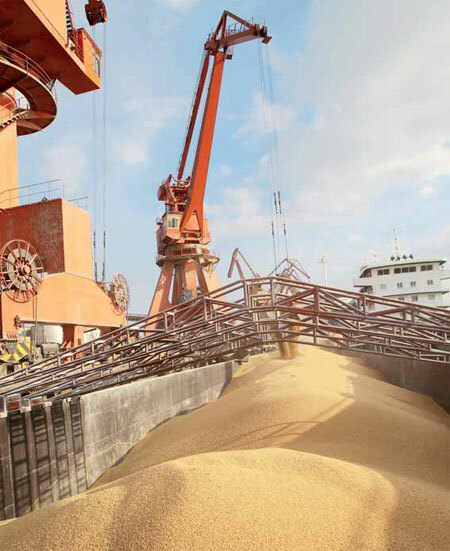 Lu Bu says the majority of Chinese companies import soybeans through four large international grain dealers – ADM Co, Bunge Ltd, Cargill Inc and Louis Dreyfus SAS. “However, if Chinese importers could purchase from foreign producers or become producers in foreign country, around 20 percent of their costs can be saved,” Lu says. ZTE Energy Co Ltd, a Chinese company that makes products in various industries, from solar energy panels, cell phones to agricultural products, has also found ways to supply China’s needs for palm oil in Indonesia. ZTE Energy purchased two palm oil companies in Indonesia’s Kalimantan Island with 30,000 hectares of farmland in 2009. About 13,000 hectares are planted with palm trees. With a $100-million investment, the company is expecting to produce 50,000 tons of palm oil by the end of this year. In 2011, 50 million tons of palm oil were produced globally and more than half of that output came from Indonesia. Indonesia has surpassed Malaysia to become the world’s largest palm oil producing nation, according to a report released by the Food and Agriculture Organization of the United Nations this year. “We have discovered that more foreign investors are interested in investing in the palm oil business. About half of the palm plantations operating in Indonesia are foreign investment projects,” says Cui Yaping, vice-president of ZTE Energy. “China needs a certain percentage of food and food-related products from abroad. We see our role in that, we can grow agricultural products in suitable countries and bring them back to the domestic market to meet the (food) demand,” Cui says. China feeds more than 20 percent of the world’s population despite having less than 10 percent of the world’s agricultural land and less than 6 percent of the water resources, according to the agriculture ministry. Increasing agricultural investments overseas could help China ease the pressure to find more natural resources in the country and strengthen its food security. “With diversified agricultural investment measures in abroad, I am very confident that the balance of supply and demand will be met in China. For investment, technology, local farmer education and logistics are all key factors. You must keep in focus. You have to commit and deploy to fight new challenges,” Cui says. This entry was posted on Monday, June 11th, 2012 at 2:56 pm and is filed under Uncategorized. You can follow any responses to this entry through the RSS 2.0 feed. You can leave a response, or trackback from your own site.